Tired of there being nothing on the tube? Well that's going to be a thing of the past, thanks to the all new Tetris channel! Hey, you like Tetris, right? Of course you do, so no doubt you'll be happy to pay three bucks a month to play Tetris on your TV via it's own dedicated channel? Hey, where are you going? Wait up! 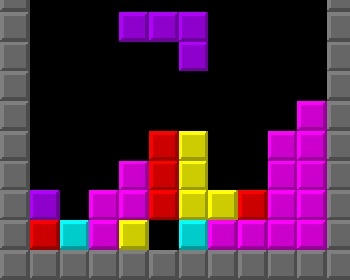 In a partnership with Oberon Media and The Tetris Company, DISH Network subscribers can gain access to a dedicated Tetris channel for the low cost of $2.99 a month. For your cash, you'll get access to a 15 level 'Marathon' version of the game, as well as a time-attack mode where you have to clear 40 lines as quickly as possible. The service will have leaderboards and the capacity for tournaments in the future, allowing you to play against other armchair Tetris fans and is expected to be a big hit with gamers who enjoy frustrating, unresponsive peripherals, and those people who haven't heard about this new-fangled 'internet' thing.